Not much to say about this one. 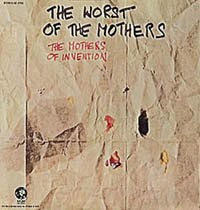 It's another unauthorized (by Zappa) Mothers compilation that contains tracks from the first three Mothers of Invention albums. Fairly standard stuff, except that it starts off with an amended version of "Help, I'm a Rock" that, from what I can tell, only includes the "In Memoriam, Edgar Varèse" section (the second part of three). Kind of cool in that it leads off the album, but from there, it's all (from what I can tell) the album versions of the rest of the songs. Seems like about half of them are from We're Only in It for the Money. They are edited together fairly nicely, so the songs almost blend into one another. I have KBOO's (Portland's community radio station) DJ (promo) copy of this record, which I think is kind of cool. (I know it's theirs because it has "KBOO" written in magic marker on the cover.) The promo is by no means rare, and neither are any copies of this album. It's just another one that I picked up for fairly cheap because I wanted to have it. Terrible cover, nothing better on the back. Really the ugliest of all Mothers records. And another one that Zappa purists scoff at. Good for them.